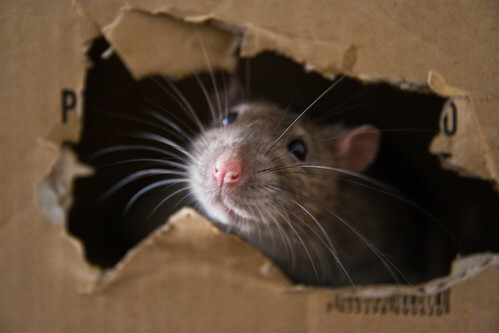 For everything to do with rat housing, from cages, litter and bedding to accessories and toys for your rat. Not for advertising items for sale. What at the minute do you want to get for your fuzzies? Other than the day to day stuff. I just saw this and thought - how blooming fab! That is ace, but ouch at the price! Mummy to the Rattray rats. Waiting at Rainbow Bridge - 27 ratty angels. It's cool though - I want something like that for my boys. I might make a mansion out of some cardboard boxes! Rat hammocks, cubes and tubes for sale! Sarah_B wrote: I might make a mansion out of some cardboard boxes! I did this - turns out my masterstroke was putting one small box perched on the very top with most of one side removed. This is Bunsen's lookout tower, and he loves it and spends hours in it. I thought my masterstroke would be the postertube tunnel, but noo, it's the tiny box! Just goes to show what I know, eh?! Opps must have missed that one! Well if you can't wee in your own little mansion where is the fun in that?!?! My boys must be the only boys that don't really scent mark everything or do the piddle and walk thing! Bless them! I have got them the Octopus thingy - that looks ace!